Last chance to have a 35803 zip code. Nestled in a special pocket of southeast Huntsville with rich local history, Cobb's Cove offers distinctive living in a setting reminiscent of simpler times. Rest easy and enjoy your new home at Cobb's Cove, Huntsville's first Ring neighborhood. In addition to having only one entrance into the community, every LeeHouse home will be equipped with a Ring doorbell with audio/visual surveillance. You are unique...where you live should be too. Two paved trailheads leading to the Aldridge Creek Greenway. The Greenway offers miles of paved trail stretching from Ditto Landing Marina to Mountain Gap. Extracurricular activities can be enjoyed at nearby New Bailey Cove Library, McGucken Park and Southeast YMCA. 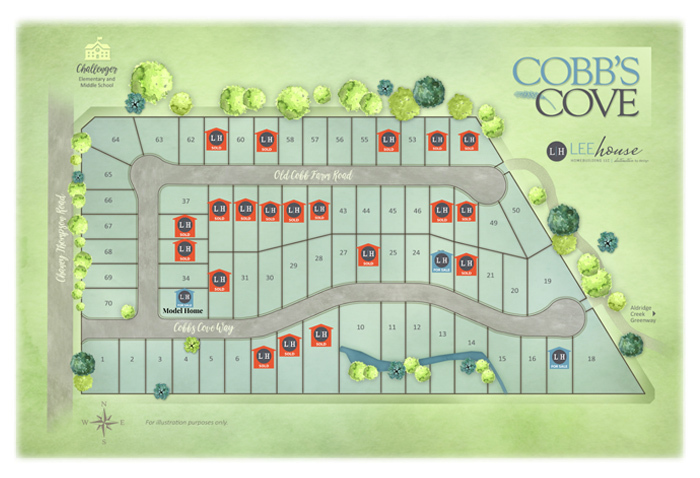 Cobb’s Cove is a convenient location for doing all the things you love! LeeHouse offers a collection of innovative architectural plans for your new home. Our designer anticipates how the home will live with thought to traffic flow, ample wall space for furniture and art placement and fenestration to capture the best views while maintaining privacy. Our plans provide flexible options so that you can customize the home to fit your lifestyle and needs. LAND HAS A STORY. People do too. People include the story of where they live in the one they tell about themselves. Cobb’s Cove has a story and it’s mostly about the two fine folks who called it home for years, Wallace and Ortha Cobb. 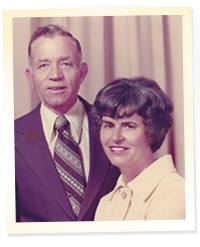 Anyone living in the area any length of time came to know Mr. and Mrs. Cobb. Wallace loved to talk and he liked people. One of his favorite pastimes was sitting out in front of his modest red brick home sharing jokes and telling tall tales with whoever stopped by to listen. He loved the land and enjoyed growing vegetables which he sold from the front yard whenever there was an overabundance. The family joke was the longer folks stayed and talked, the cheaper the vegetables! Once, the Cobb’s had pumpkins for sale and someone asked Ortha how sales were going. Ortha reported she’d sold two pumpkins for 40 cents each and then another for 20 cents to some school kids...and Wallace had given away four! Mrs. Cobb was the quiet one but most of the time she found her husband amusing. The Cobb’s raised their three children in the red brick house on the farm and enjoyed many happy years there, from 1958 until 2014. The children shared that Wallace never went on vacation because he said no place was better than his homeplace. Ortha shared his love of their home...on her deathbed, Ortha said her little house on Chaney Thompson Road was the best thing she ever owned in her whole life. May the Cobb family legacy of happy homeownership be passed down and enjoyed by the future generations who call Cobb’s Cove home. "I grew up here. I love this part of town. I am so excited to have the chance to live in a beautiful new home with such a quaint setting, and so close to schools, shopping, and recreation."